The Lunar New Year, or Chinese New Year (CNY) is such a dramatic and fun celebration to be part of but what do you you do if you can’t travel to China this year to celebrate? You join the local celebrations in the country you’re in of course! With so much of the world’s population loving to travel and now living in all corners of the globe many fabulous and fun traditions and festivals from all nations and cultures have travelled with us. The Chinese have historically been great traders and early immigrants to many countries. They historically settled near the ports in cities their trading ships visited establishing communities for social celebrations and support in the new country. In many of those cities these communities and associated business districts survived and today are thriving offering up some amazing restaurants, an incredible resource for us foodies trying to source that essential but elusive ingredient and even being a popular tourist attraction in many places. Even if you can’t travel to China this year there’s no reason to miss the fun and spectacle that can be found at Chinese New Year celebrations in cities all around the world. The Lunar New Year falls on Saturday 28th January in 2017 with celebrations running from New Years Eve on the 27th through to the 2nd February. We’ll be saying goodbye to my zodiac year, the Year of the Monkey, and hello to the Year of the Rooster. I was lucky enough to spend Chinese New Year in Hong Kong last year, and it is still to this day one of my favorite travel experiences! The only reason I actually went was because I found a flight for $42, and it was one of the best last-minute purchases I’ve ever made. Hong Kong is such a vibrant city, and one of the best cities to explore as a photographer! Combine that with the Chinese New Year celebrations and the insane Firework display, you know you are going to have an amazing trip! My top tip would be to plan ahead for where you are going to watch the fireworks, because the city does get extremely crowded during this weekend. While the accommodation costs do get a bit pricey, it’s still 100% worth the visit, and I really do think it’s one of the best places to celebrate the Chinese New Year. Elaine and Dave from the Whole World is a Playground shared their fabulous experience in Vietnam, this one is definitely going on my list. Our time in Vietnam coincided with Tet, the Vietnamese lunar new year festival and the most important celebration in Vietnamese culture. We spent the days leading up to Tet in Hanoi and the city was in a frenzy as the New Year approached. Motorbike cargo always borders on the extreme in Vietnam but we watched, fascinated, as orchid trees replaced fridges and extended family members on the back of the bikes. Red envelopes were passed to children in the streets as their elders gifted money for good luck and were rewarded with Tet greetings. As the days drew to a close families took to the streets outside their dwellings and small fires burned in the darkness as they made offerings to their ancestors. 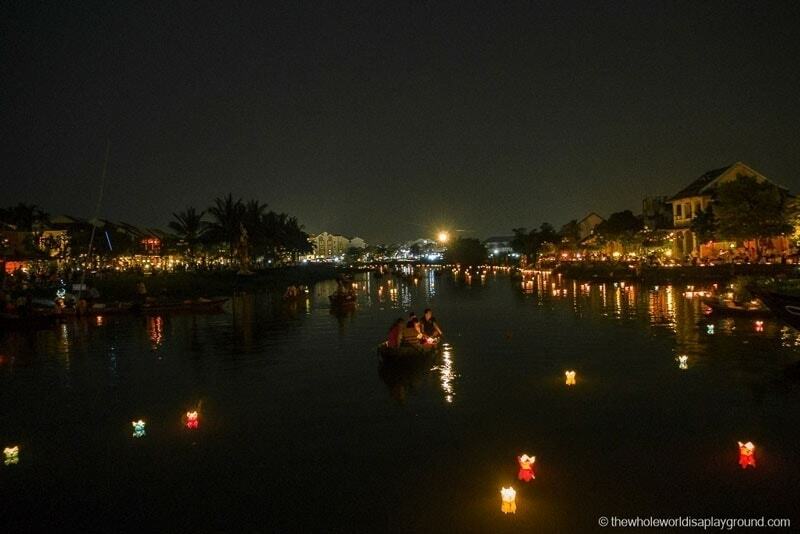 We left Hanoi for Hoi An just in time for the lunar new year. Locals and tourists alike poured onto the city streets and spirits were high in anticipation of the clock striking midnight. Colourful plants lined the pavements while flower covered cars and giant lion costumes were paraded through the streets. As darkness fell on New Year’s Eve lanterns replaced electric and the ancient town lit up with a sea of candles and lanterns. The Japanese Bridge and the Song Thu Bon River are the focal point of the celebrations and tiny sampan boats floated through the lantern filled rivers. As the clock struck midnight fireworks exploded in the sky and we watched in awe as we celebrated the arrival of the new year. The celebrations didn’t end with the fireworks. As we wandered through Hoi An the following day we were inundated with offers to join Vietnamese families in their New Year celebrations. Diet coke and candy was the order of the day as we sat in a circle chatting in broken English with a beautiful Vietnamese family. Mar Pages from Once in a Lifetime Journey has some great suggestions on her site for spending the Chinese New Year holiday in Singapore. Chinese New Year in Singapore is the largest celebration of the year in the small multi-cultural city-state. Although celebrations from all ethnicities and religions are observed in the country, this is the largest and most important as Singapore’s Chinese community is the most significant. The streets fill with people in the days preceding the celebrations and Lion dancers stop by all offices and streets to perform. You will see oranges and small orange trees everywhere. This is because the word orange in Chinese sounds like the word Luck and it is customary for people to give them to their relatives when they visit. Another Chinese New Year tradition are the red envelopes where money is deposited and given. During the days of the New Year, Singapore becomes a real ghost town and all shops will be closed. In fact, supermarkets start emptying their shelves a couple of days prior to the closure and everything and everyone stays at home and does the round to visit friends and family. 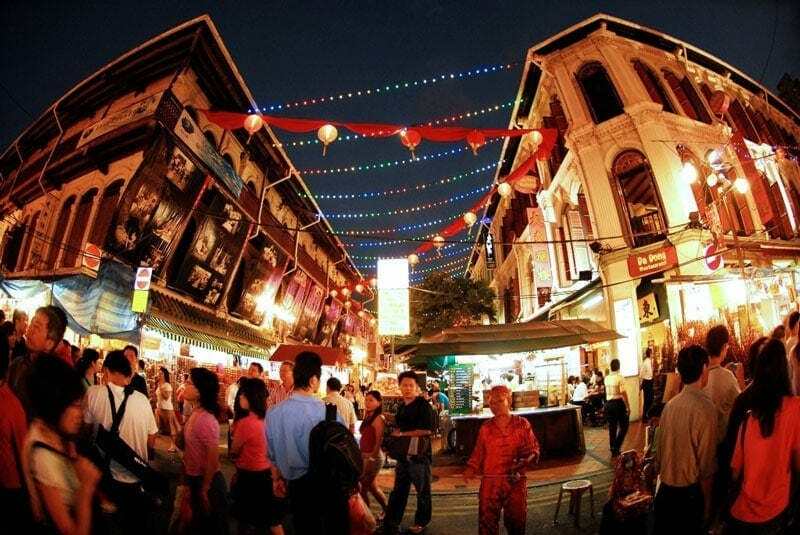 If you happen to be in Singapore for the days of Chinese New Year, there are a few things you can do to keep busy and, of course, Little India will still be open. We were in Kyoto for the New Year a couple of years back. Japan follows the Gregorian calendar as we do in the West rather than the lunar calendar so to celebrate CNY you need to head for one cities with a vibrant Chinatown. There are three to choose from, either Yokohama, Nagasaki or Kobe. Kobe is less than half an hour on the bullet train from Kyoto, we hadn’t been to the city before and it’s covered by the Japan Rail Pass so we headed there. I loved that this was a true local festival. They had the lanterns, lion and dragon dances, and the fire crackers but mostly it had a lovely local family atmosphere. We loved watching all the performances by the youngsters from the community, these girls in their dance recital were adorable but the boys of a similar age with their martial arts moves were equally sweet. The other ‘best thing’ about a visit to Chinatown, expecially during the celebrations, is the food. Of course we had to sample some and it was all delicious. If you are thinking about a visit to Kobe, for the Chinese New Year, or at any time here are our tips on the things not to miss in Kobe. Lyn Baker of A hole in my shoe was in Melbourne last year for the celebration. Melbourne is home to Australia’s oldest Chinatown and one of the oldest outside of Asia. I have only been to a couple of Chinese New Year celebrations and have found them to be a lot of colour, noise and excitement. 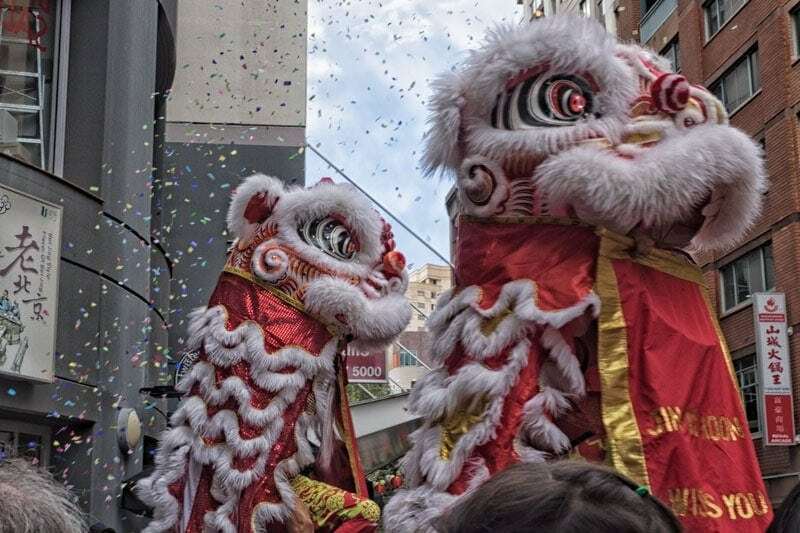 Chinese-Australians in Melbourne celebrate this cultural festival with the same vigor and energy as they do in China, making a visit coinciding with Chinese New Year a vibrant and cultural event not to be missed. The city drapes itself in festive colours, decorated with Chinese lanterns and large illuminated Zodiac figures. The traffic comes to a standstill as an exciting dragon parade featuring a 100 metre long dragon travels through the streets. A tradition for Melbourne’s Dai Loong Association, the vivid dragon is accompanied by beating drums, cymbals and gongs as everyone stops to watch this magnificent parade. Melbourne’s streets become noisy, chaotic and colourful. Transformed with an energetic atmosphere Southgate, Crown Casino, Myer, even the famous Windsor Hotel, feature spectacular Chinese New Year themed decorations and colourful lanterns. 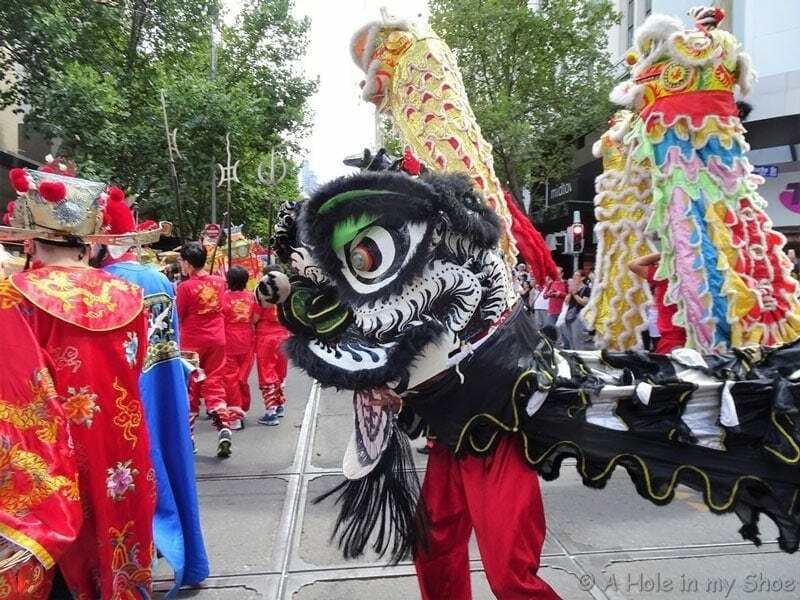 Each year residents can expect fireworks, food, lion dancers and spectacular dragons to take over as Melbourne’s massive Chinese community celebrate with festivals and events. The Chinese New Year celebrations, known to bring people joy, happiness, good luck and good health are full of activity and booming with loud drumming music and firecrackers. If you have never ventured into the midst of Melbourne’s Chinese New Year festival you are missing out. It is very much a lively to-do event and a genuine cultural experience. In 2016 we headed to Sydney for our wedding anniversary which overlapped with the 20th anniversary of the Chinese New Year celebrations in the city and 30 years of the sister city relationship with Guangzhou. The city embraces the New Year celebrations with over half a million visitors to the city flocking into the central city to enjoy it. The festivities take place right across the city with hubs in the Circular Quay area, Darling Harbour and Chinatown. There were giant lanterns of all of the animals of the zodiac. Being the year of the monkey it got pride of place on the steps to the Opera house but the rabbits at the top of the page and the dragon were other favourites. Ask many people and the food at the pop up Lunar Markets in Pyrmont Park were the hightlight, although a couple of meals and snacks in China town are essential too. The Lion Dancers and drummers must have been exhausted after putting on an incredibly energetic show as they made their way around the shops, restaurants and businesses retrieving the lucky red envelopes above the doorways. The Darling Harbour precinct had its own celebrations and lanterns too just across from the Chinese Friendship Gardens. All in all definitely one to visit if you’re in the city. If you are planning a fabulous Chinese New Year in Sydney this year you’ll find all the information you need in this article. Auckland is home to a wide array of different cultures. It’s no surprise that with each coming year, all of Auckland gets together to celebrate the festivals that are important to each. Starting the year off is the Chinese New Year. For one weekend in February, Auckland council along with the Asian community and all of their fantastic volunteers gather at the Auckland Domain for the Lantern Festival to celebrate the new Lunar year. 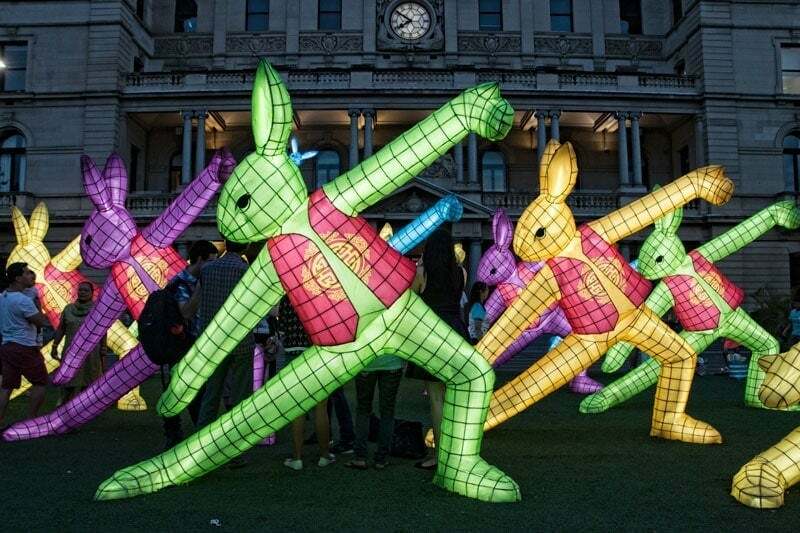 Whilst you’re there give your taste buds a burst of flavour with different types of authentic Asian cuisine and enjoy the fantastic lanterns on display. This is the best way to experience the Chinese New Year when you’re in the land, just a little further, down under. The oldest Chinatown in north America is in San Francisco and Carole of Berkeley and Beyond gives us a taste of their celebrations. 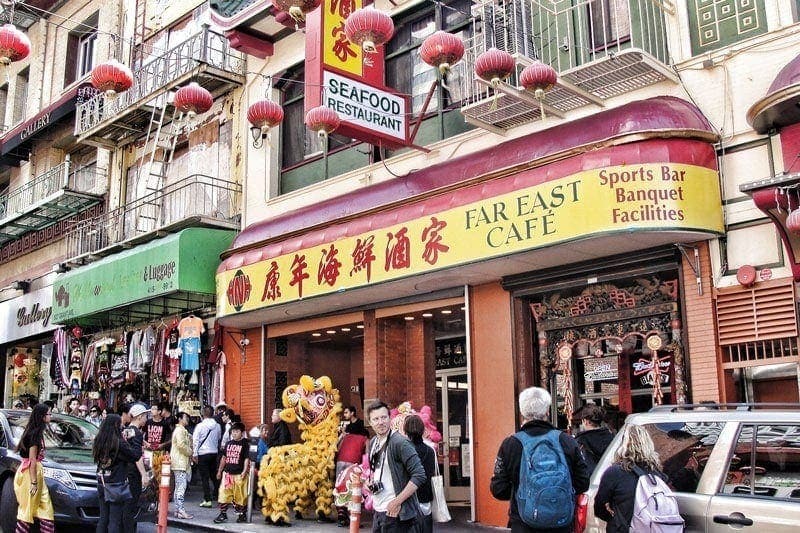 San Francisco’s Chinatown is the largest Chinese community outside of Asia. Every January or February, depending on the lunar calendar, it has one of the largest Chinese New Year celebrations outside of Asia. First held in 1851 and held again every year since, the Chinese New Year Festival & Parade enlivens this already lively area. 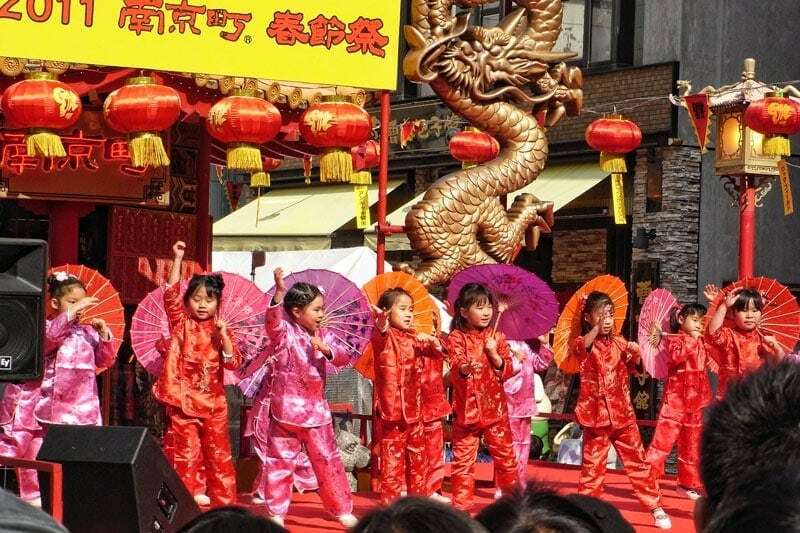 It includes a beauty pageant, an outdoor carnival in Chinatown, and the famous illuminated night parade featuring a spectacular block-long golden dragon that represents fertility and power. During this period you’ll see colorful smaller lions visiting various shops to bring them luck for the new year, and the sound and smell of firecrackers permeates the air. So there you have it, a variety of options for experiencing the fun and festival of the Lunar New Year outside of mainland China. Do you celebrate? If you’ve been to celebrations around the world we’d love to hear about them, let us know in the comments below. A good friend of mine was just telling me about how he and his family celebrate the New Year. There are a lot of great traditions! I would love to be able to see a celebration for myself one day. I think the place I’d pick would definitely be Hong Kong though. Those fireworks look amazing! Wow these photos are bright and make we want to party! I would love to go back to Hong Kong and celebrate there, but any of these cities would be great. We live in Malaysia and the city we live in also becomes a bit of a ghost town during Chinese New Year–don’t make the mistake of trying to go to the mall that week because a lot of shops will be closed! But we love all of the CNY dinners with friends! Awesome friends and food – the best way to celebrate! We joined a Lunar New Year celebration in Seattle once and it was fun. I suppose they’re going on everywhere around the world. They certainly know how to celebrate. I love all the bright colors. Oh enjoy Vietnam in February, sounds fabulous! In Malaysia, where CNY is widely celebrated especially in bigger cities and towns like KL, all the shopping malls are decorated like maybe one whole month leading to the day itself. More often than not, there’d be lion dances in those malls, and sometimes in hotels too. My favourite though, is watching lion dances & tricks on poles, their acts sure require some serious skills honed over a few years, at least. I go past China Town here in London every day of the week and they’re already setting up for the celebrations. Despite being a small area it really feels more alive at this time of the year. Love to see these Lunar New Year celebrations. We were in SE Asia just before the LNY a few years back, and the festivities were a lot of fun. We rang in the Lunar New Year in Kuala Lumpur, which had a huge fireworks display. Such a fun holiday and event that not enough people in Europe/North America get to celebrate. 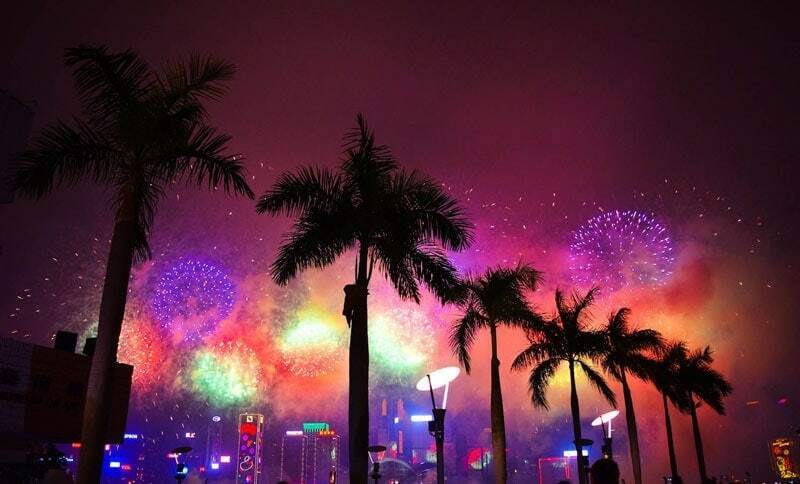 We are hoping to relocate to Hong Kong next month, so we will probably just miss the celebrations this year, we are looking forward to catching them in person next year! I’d love to be somewhere Iike Hong Kong or Japan. CNY is celebrated vastly as you have shown. Love living in a city (Sydney) where it is completely embraced and we are able to enjoy it completely. Toni thanks for including our contribution to this post. We enjoy Chinese New Year celebrations and you showcase some lovely areas to celebrate it in future years. Thanks for taking part Lyn, some great new options for our list too. We were in Singapore and Vietnam around the time of the Lunar New Year in 2016 and the preparations for this event were epic. We couldn’t believe the amount of people employed and the extravagance of the decorations everywhere on the streets and in the parks. In particular Vietnam, being a relatively poor country was splurging on decorations and electronic displays. It would be great to experience it however. That sounds incredible Kathy, I know putting this list together only added to my already very long list of countries and events to get to!